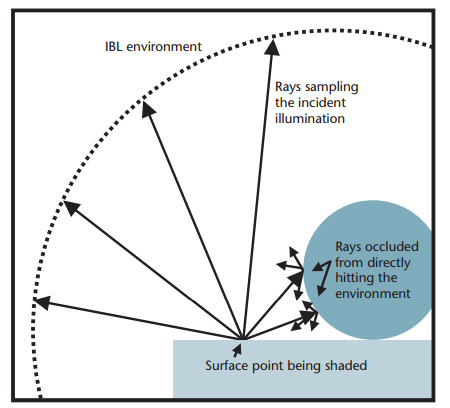 Image Based Lights (IBLs) allow to represent the incident lughtning surrounding a point. Often use Diffuse and Specular cubemaps. The main problem is that even with importance sampling we still need to take a lot of samples! We can use MIP maps to reduce sample count, but counts still need to be greateer that 16 for approriate quality. As it based on blending between many environment maps per pixel for local reflections, we can only practically afford a single sample for each. First sum pre-calculate for different roughness values and store the results in the mip-map levels of cubemap (typical approach). In Unreal4 minor difference is they convolve the environment map with the GGX distribution of their shading model using importance sampling. The lighting is pre-integrated offline with the normal distribution function (NDF) of the BRDF and the cosine from Lambert’s law for different Specular Power values. We can use and need to try couple aproxx. This entry was posted in Uncategorized and tagged ibl, pbr by admin.